I hear people say that Episodes 2 and 3 were crap but a lot better than 1. Well you’re wrong. The Phantom Menace is the 4th best film in the Star Wars saga. I’m going to weigh up the good and the bad of it in an easy to read format and by the time you finish reading you will agree with me. 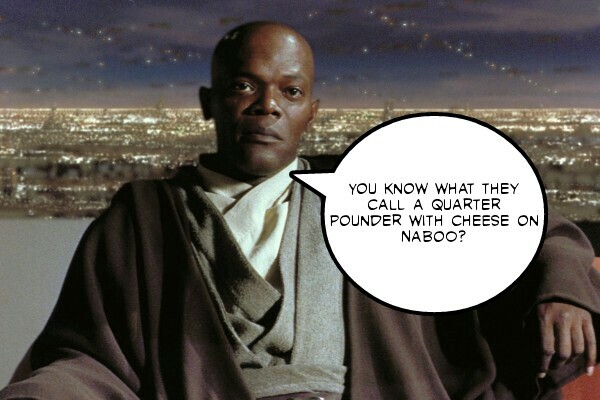 Many Bothans died to provide me with this insight so please try to take it all in. OK so what’s bad about Ep1? 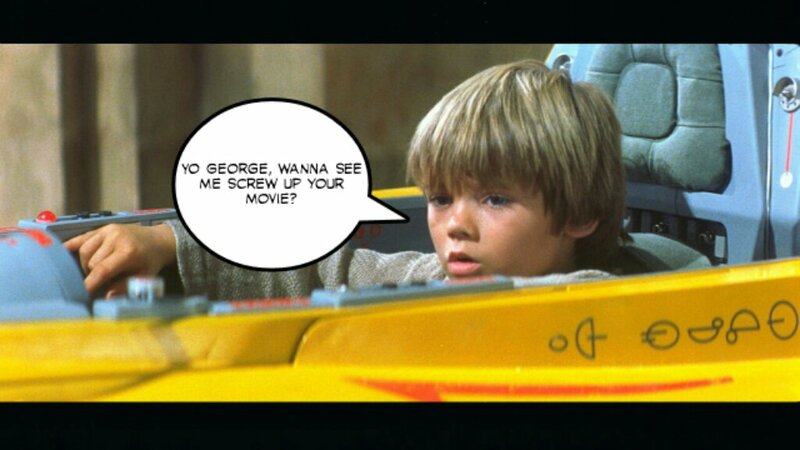 The movie is all about him so why in the name of the force did Lucas pick such an annoying little brat. The blame can entirely be put on the script which becomes a cynical attempt to appeal to children that backfires horribly. If Annakin had been made a little older it could have made for a better film. The biological explanation for ‘The Force’. Never ever mentioned in the original trilogy all this did was ruin the mysticism of the Jedi Order. We always saw it as a religion, an intangible supernatural er, force making the Jedi Knights into a type of warrior monk. Midichlorians makes it seem like they are genetically mutated super soldiers taking away the wonder a lot of us grew up with. ‘A trade embargo, what’s the problem with having a film about that?’ I don’t hear you ask. The problem my friend is that this is a f**king Star Wars movie not an intergalactic episode of The West Wing. 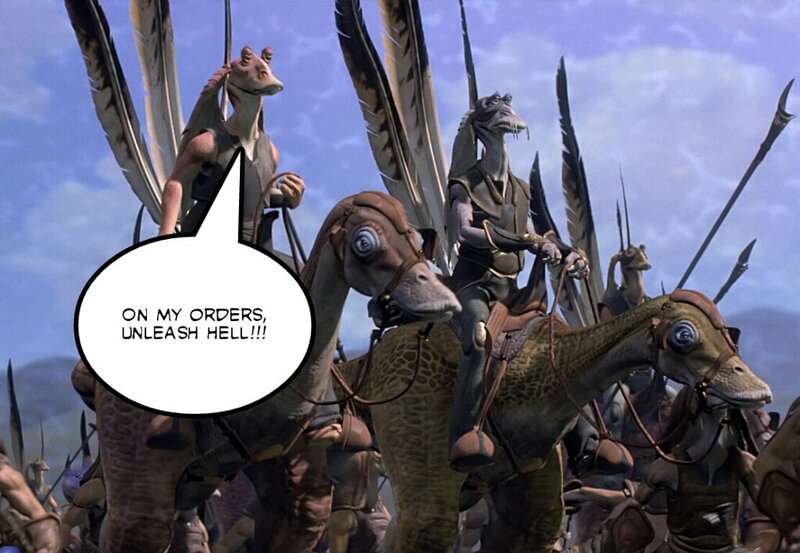 I don’t care if Naboo is at the mercy of a trade federation, I want my Star Wars films to be written in broad strokes, good vs evil, the little guy struggling against the man, not trade disputes between thinly veiled racial caricatures but maybe that’s just me. No wait it’s everyone. 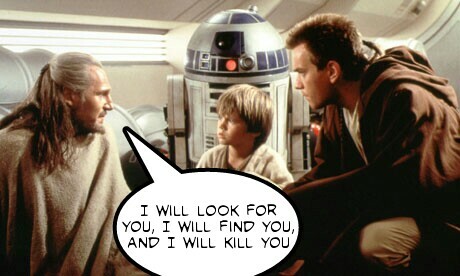 Yep, Big Liam (as Neeson is officially known on this blog) is amazing in this. Think about it, he’s probably the only likeable character in all three films. The big man from Ballymoney gibes good mentor. He’s the closest thing the prequels get to memorable Star Wars character. So what do they do? Yeah kill him off and leaving the films in the hands of Ewan McGregor and Hayden Christianson. Nnnnnnoooooooooooooo!!!!!!!! The soundtrack is amazing. John Williams stepped up to the plate to deliver a beautiful composition called Duel of Fates which was so good that the other prequels never produced any music half as good. It’s one part of the prequel project that lives up to the original classics and be held up beside the amazing soundtracks of the original trilogy. I don’t think I’m out of line in saying that Ep1 has the best light sabre fights of the entire saga. From the short but exciting showdown between Qui-gon and Darth Maul on Tatooine to the epic three way between the two Jedis and Maul on Naboo the fights are fast, dangerous, and jaw-droppingly choreographed. Why could the other prequels not have anything as good? And you can watch all three of these highlights below! You might notice a big gap in the ‘bad’ list where a certain Gungan should be. Well I’m going to lay my cards on the table, adjust my tie, clear my throat, and mutter the following admission – I actually like Jar Jar Binks. That felt good. He’s a silly character that’s in line with Star Wars convention. OK, he probably gets too much screen time but his clumsiness is pretty endearing to me. The gnashing and wailing of the fanboys about Jar Jar did nothing but force legitimate criticism of the film to the background. Whining about Jar Jar meant that the real reasons for the disappointment were lost in a haze of nerd noise. I think it’s time for a Jar Jar amnesty starting now. Now that I’ve convinced the world that The Phantom Menace is actually pretty good I’d like you to let me know any films that the world thinks are bad but you like. It could be anything from Big Momma’s House to Big Mommas: Like father, like son. So basically any Martin Lawrence film. Try to convince us that some bad movies need to be reevaluated. Peace out mofos! I can’t stand Jar Jar Binks. I couldn’t understand a word he said. Love all the actors, but hate how Lucas killed his classic….I will agree with you on J. Williams–the music is so dramatic and appropriate. The script! Good God it’s awful. LOL I will grant you that. The others got a little better but still had terrible dialogue! Thank you for this article! It takes guts to admit not hating The Phantom Menace but I will stand up with you and admit I don’t hate it either! 😉 The prequels have their problems, but I don’t believe they fully deserved all the hate they’ve received. The lightsaber battles in this movie are truly epic, and John Williams’ “Duel of the Fates” gives me goosebumps every time. Shut up Anakin was a cutie, that’s why I watched it when I was a kid.